When you think about it, a deck of playing cards has a tactility and design like nothing else: the small, stiff paper panels with glossy sides, the faces inscribed with a number or letter and the equivalent in hearts, spades, diamonds, clubs and the backs intricately colored and patterned. To grip a deck with backs upward is to suggest numerological and symbolic randomness; to spread a hand is to engage in ordering and valuation; to draw and discard, to throw down money or chips at intervals is to conjecture a hand’s value in relation to others’. There are consequences to manipulating cards. Shortly before passing away a few years ago, my grandmother gave me a fancy double deck of playing cards manufactured by the Piatnik Company of Vienna. I can still see her sitting in a heavy padded armchair before a large walnut card table overhung with an enormous swag lantern and instructing her grandchildren in the games most conducive to filling a holiday afternoon. Although she was very patient in teaching us variations of go fish, poker, and rummy, she never tried to introduce us to her personal favorite, contract bridge, perhaps because it necessitated great concentration, dependable partners, and a heavy purse. Like her scotch and sodas and slightly risqué jokes, bridge seemed to us an adult ritual that belonged to those who made it through the Great Depression. The letter cards of this deck—the king, queen, and jack—seem peculiarly suited to my aesthetic sensibilities: each bears an aristocratic likeness adapted from a famous early modern French portrait. The “court of diamonds,” for example, is represented by busts of Henri IV and his second wife, Marie de’ Medici, after full-lengths by Frans Pourbus the Younger, and Cardinal Richelieu after Philippe de Champaigne. All the figures are swathed in generous draperies that make the fusion between their upright and inverted aspects appear seamless and are colored with brilliant primaries against a pale yellow ground. However, the designer’s determination to adhere to baroque pictorial illusionism instead of conventional flat patterning lends the personages a strange palpability that seems almost monstrous—like Siamese twins bending backwards. Anon. (after Philippe de Champaigne), Cardinal Richelieu as the Jack of Diamonds, from France Royale Bridge playing card set, Piatnik Compnay, Vienna, ca. 1990s. The decision to model the figure of the jack of diamonds on Champaigne’s portrait of Cardinal Richelieu was probably motivated by the circumstance that so many copies are held in public collections (e.g. National Gallery, London; Louvre, Paris; National Museum, Warsaw). All of these copies are based on a slightly smaller lost original painted in 1635 for the Galerie des Hommes Illustres (or Gallery of Famous Men) at the Palais Cardinal (now the Palais Royal), Paris. Never reluctant to parade his power and achievements, the cardinal had commissioned the painter to fill his gallery with twenty-six full-length, over life-size portraits of great men of France spanning Abbé Suger to Louis XIII. Because this series was engraved shortly after completion, we know something about the appearance of the cardinal’s first portrait, which the London copy most closely resembles. Philippe de Champaigne, Cardinal Richelieu, 1637 copy after a lost 1635 original. A native of Brussels, Champaigne was familiar with the grand format portraits of the Flemish masters. 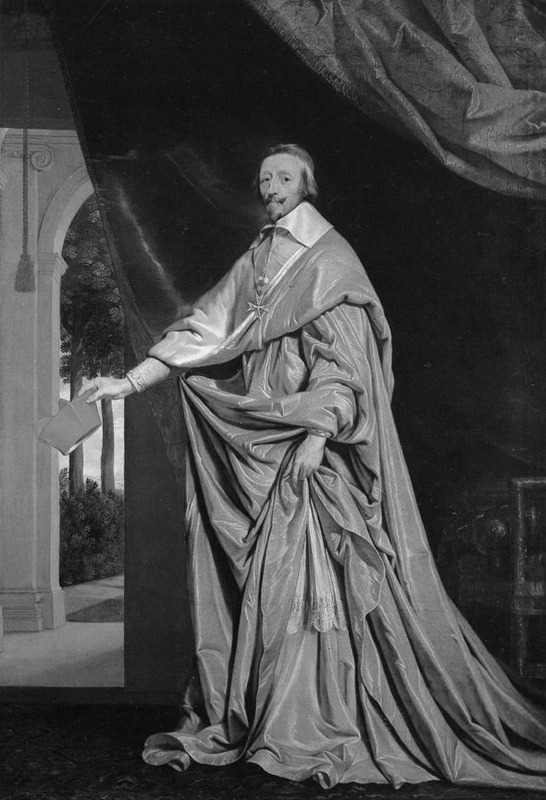 His Richelieu mimics the pose of Van Dyck’s Genoese clientele of the 1620s: a solitary figure draped in an elaborate vestment consisting of an ermine stole, a voluminous red cappa magna (or mantle), a white rochet (narrow-sleeved, lace-edged over-garment), and a red cassock extends one hand to motion the way with his biretta (four-crested cap) and employs the other to gather up the folds of his ponderous garment. The head is a study of the effects of long working hours upon a fifty year-old administrator: gray hair, flaccid flesh, and lined eyes are meticulously rendered to suggest probity and vigilance. The white linen collar, the pale blue ribbon of the Ordre de Saint-Esprit, and lace-edged surplice, lend the form textural variety and signify that the individual is currently engaged on secular matters. The habit is drawn and modeled in a way that seems hard, even brittle at the edges yet fluid on the surfaces, not unlike late Mannerist sculptures. Rendered from a low viewpoint, the figure appears to be composed of solid geometries: the lines of recession intersect with the folds of the garment to demarcate at least four triangular units secured by the right hand. 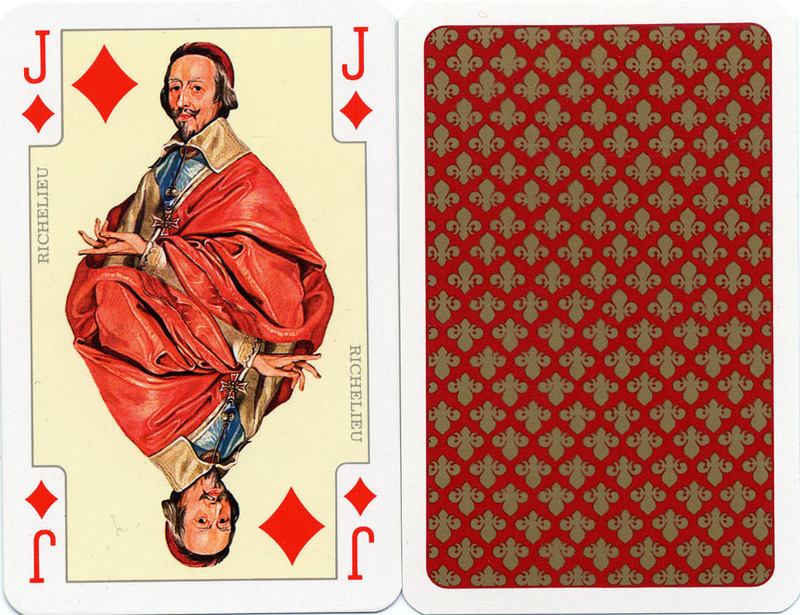 Richelieu’s satisfaction with the portrait can be assumed from the large number of copies in circulation, some of which show the left hand repositioned to assume a florid rhetorical gesture—of the kind that appears on our playing card. The designation of Richelieu as the third member of the royal suite is especially interesting in light of his political ties to Marie de’ Medici and Louis XIII. Armand Jean du Plessis was educated in Paris, became Bishop of Luçon in 1606, served as Secretary of State to Marie de’ Medici and her protégé Concino Concini until the latter’s assassination in 1617, was recalled by Louis XIII to negotiate peace with her after a disastrous civil war, and was made Chief Minister to the king in 1624, a position he retained (along with the new title of duc de Richelieu) until his death nearly twenty years later. His principle contribution to the state consisted of centralizing the French monarchy at home by limiting the resources of rebellious nobility and increasing its strength abroad by pursuing diplomatic alliances meant to frustrate Austro-Spanish hegemony. Yet the Bourbons never completely trusted him and the nobles and commons downright despised him. Marie de’ Medici regarded Richelieu’s service to her son as a threat to her own influence while Louis XIII repeatedly questioned his minister’s draconian and brutal methods. It is significant that by the early seventeenth century the knave of diamonds had acquired a bad reputation in France and England as a worthless fellow or an evil omen. The French expression “Il est un valet de carreau” (“He is a knave of [floor] tiles”) suggested a “man of the pavement” or loiterer who sought to take advantage of passers-by; the English epithet “scurvy knave” suggested a sea-faring rascal (in the diamond import business?) who brought his illness back to port to infect inhabitants. Both epithets seem readily applicable to a vigilant minister navigating the “ship of state.” Political personages and state functionaries were first ridiculed on playing cards during the French Revolution, when satires and caricatures flooded the Paris and London markets. Our contemporary card follows this tradition in raising an unfavorable comparison between Richelieu and the n’er-do-well: both had an ominous gaze, were bearded, and sported a deceptively elegant “hook,” the cardinal’s curled finger being similar to the knave’s halberd with its serpentine flourish. In a strange twist, the graphic designer gave the queen and her allies a belated, symbolic form of revenge they could never have afforded in life, the cardinal’s double hook at once persuading the great and ensnaring the weak. But then my grandmother, who was affectionately known as “queen of the card table,” would have said that whatever “hand” I was dealt in life, it was in my interest to make work enjoyable and to take leisure seriously.